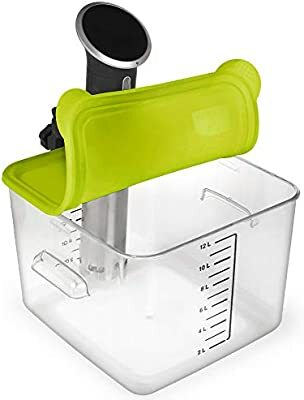 I am considering getting a EVERIE Collapsible Silicone Sous Vide Lid for a 12 quart Rubbermaid Container . The lids come with either a side or corner mount. From a space utilization perspective, which is the better mount? Should I be considering another brand of lid and / or container? I use the corner mount. Works great and can be used on either 12 or 18 Qt. Size container. Feel the corner location circulates well and does not interfere with what you put into bath. I have this set up with the corner holder....works great! I use a cooler as my cooker and started making a sous vide fitting to do so, while maintaining the integrity of the cooler. The advantage being I don't worry about evaporation when cooking over a long period of time. Plus, I can cook huge roasts with no problem. Anyway, I've never posted anything on line before but you can let me know if you're interested! Boughtthe ones pictured and LOVE them! Very effective and efficient!